Epner's Hartford startup aims to ease C-suite headaches | HartfordBusiness.com . New to the site? Click here to register. Robert Epner has developed a corporate strategy management software that allows executives to oversee complex companies. Highest education: MBA in finance, New York University, 1982; advanced IT certificate, NYU.
" … Seek out where are the problems that your organization is struggling with and … take the initiative and come up with solutions even if no one's asking you for that because that's where creativity and innovation comes from — and particularly difficult problems that maybe no one else wants to try to tackle. Those are the key ones and have the biggest payoffs." Robert Epner drew on his successful experience as a chief operating officer for a multinational corporation to develop a software that makes C-suite executives' lives easier, particularly managing and implementing strategic plans, but also merger integrations or other initiatives in large, complex organizations — whether for-profit or nonprofit. He got the idea for Hartford-based Chiefofstaff.com after leaving ING Group in 2009, where he was COO and chief of staff for the Asia Pacific region and oversaw 12 countries with two businesses each, insurance and asset management, and 10,000-plus employees. The complexity of overseeing 24 businesses in different stages and countries required him to develop methodologies to make it easier to communicate and pull together the businesses' plans, while communicating effectively to headquarters. After leaving ING, he worked a couple years for an insurance industry consultant, then began devising tools he would have liked in the C-suite. "I sort of took the practices that I used in that role as COO and chief of staff and married it to this new cloud technology and mobility technology, and that's the inspiration for Chiefofstaff.com," said Epner, 57, who spent most of his career in the insurance industry, including 22 years combined at ING and MetLife. Chiefofstaff.com provides live views into the status of implementing strategic plans as staff update their progress across departments, businesses and countries. "In effect, it provides daily briefings in real time to the senior exec and C-suite from the people who are doing the work, who are accountable for the initiatives … so it's almost like these real-time tweet updates from around the world coming together and allowing you to stay on top of your plan," Epner said. 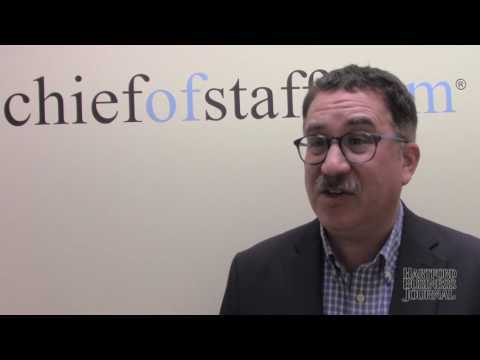 Chiefofstaff.com is breaking ground in a space he dubs CSM, corporate strategy management. Larry Sullivan beta-tested Chiefofstaff.com at a $500-million, global nonprofit he ran and was so impressed he joined Epner to help launch it commercially late last year. He believes it will change the way CEOs work forever. "This (software) gives you a clear line of sight," Sullivan said. "Literally, one tap, I could have a satellite view of every initiative in my universe globally and, with a second tap, I can look at one initiative on one executive's desk and see how it's faring." Epner lives in New York City, splitting time between there and Hartford, where his four senior leaders operate. The company's Hartford base is ideal for one of its target clients, insurance, and the region's talented workforce, he said, envisioning the company growing to perhaps 50 employees in two years. Epner said he tries to bring excitement to management and make people feel like they're growing and contributing. He encourages people to embrace problems no one else wants to solve. Epner's other passion is helping people with autism and their families. He and his wife, Alison Edwards, have a son, David Arthur Epner, 16, who's autistic. Epner co-founded the David Arthur Foundation, which aims to create world-class networked communities for adults with autism spectrum disorder that include quality housing, access to jobs, entertainment, stores, health care, sports, culture, churches and synagogues. He's partnered with the Hospital for Special Care and Corporation for Independent Living and hopes to see the first community developed in Bristol and become a national template. Outside work, Epner enjoys jogging, hiking and playing tennis in Central Park. He also writes poetry. "It's sort of an outlet for me, so I enjoy that," he said.